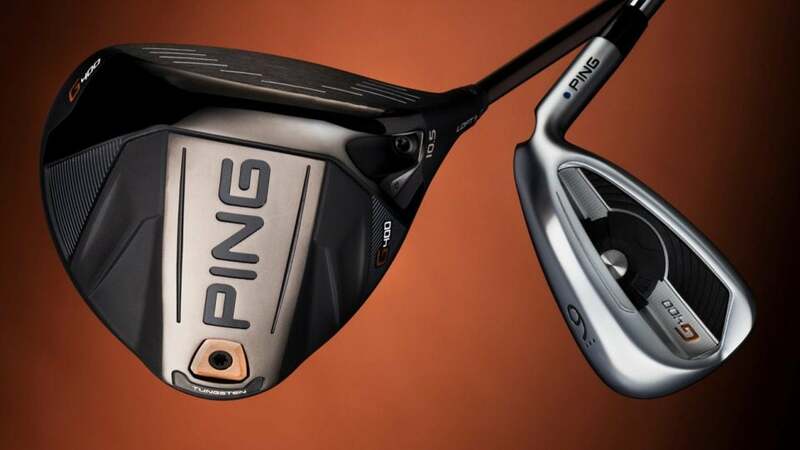 Ping's new G400 driver, which replaces the hugely successful G30 and G families, is comprised of three models: the standard G400, the LST (low spin), and the SFT (straight flight). Each will retail for $400. They come with an improved adjustable hosel design that offers better aerodynamics and settings (plus or minus 1-degree in both directions). A more streamlined, aerodynamic clubhead and improved turbulators on the crown combine to reduce drag by about 15%. That boosts clubhead speed and distance. Extra yards also come from a new, forged clubface, which is 6% thinner, offers 16% more flex at impact and delivers an extra 2 mph in ball speed. Other notable features include an internal rib structure for improved sound and feel, a thin crown to lower the center of gravity and improve MOI (for added forgiveness), and a high density tungsten back weight that creates the deepest CG and highest MOI of any Ping driver to date. In the LST, the tungsten weight is closer to the face, which reduces spin by about 300 rpm. The SFT has more tungsten in the heel, making it easier to square the face and a good choice for players who fight a slice. The standard G400 driver is available in 9° and 10.5° lofts; the LST comes in 8.5° and 10°, and the SFT models are 10° and 12°. Accompanying the G400 driver are G400 fairways ($270 each), G400 hybrids ($230 each), and G400 Crossovers ($230 each). The standard fairway woods come is 3 (14.5°), 5 (17.5°), 7 (20.5°), and 9 (23.5°) models while the SF TEC comes in 3 (16°), 5 (19°) and 7 (22°). A Stretch 3 model is also available in 13° and features a 43” shaft, larger clubhead and slightly forward CG location for lower spin rates. For those who struggle with the big stick, this club could be a great driver substitute. The G400 fairways feature many of the same technologies as the drivers including a thin, lightweight crown for optimized CG and increased MOI, an aerodynamic adjustable hosel (plus or minus 1°), and a machined backweight that further boosts MOI and stability. Clubfaces are 28% thinner than the previous G model and increase face flex by 30%, bumping up ballspeed by as much as 2 mph. A new face texture reduces spin for even more distance, while an improved sole design further enhances face flex at impact for higher launch and longer carry. G400 hybrids come in 2 (17°), 3 (19°), 4 (22°), 5 (26°), and 6 (30°) models and are built with the same technologies as the fairways, including clubfaces that are 11% thinner than the previous G model. The new design creates 35% more face flex, about 1.5 mph in added ballspeed, and as much as 5 more yards of overall distance. For those who prefer a more iron-like design, the new G400 Crossovers are a nice alternative. Available in 3, 4, and 5 models, the Crossovers feature a forward CG placement that creates straighter, longer shots and 20% higher launch than the previous G model. Other features include a “hydropearl,” chrome finish that reduces friction through the turf for better performance from tough lies, thin steel faces for faster ballpeeds and improved acoustics, and 20-gram tungsten toe weights for higher MOI and more stability. The G400 family isn't all about woods. Replacing the G iron is the new G400 ($800 steel) model, which represents an incremental improvement over the previous, exceptionally good design. The biggest change in the G400 irons is a thinner and stronger face that provides about 18% more flex at impact. When combined with an undercut cavity and Ping's COR-eye technology, the new G400 promotes higher trajectories and longer distances for a wide range of players. The increased face flex also provides improved forgiveness on off-center hits. Other iron features include a new badge in the cavity for better feel at impact, a concealed elastomer weight that dials in swing weight, and a new “hydropearl,” chrome finish that reduces turf friction and improves launch from a variety of lies. The G400s are available in seven shafts at no additional charge, including stock AWT 2.0 steel and Alta CB graphite, True Temper Dynamic Gold, Project X, and XP95, Nippon NS Pro Modus 105 and KBS Tour.